The long-in-development film version of Andrew Lloyd Webber’s hit musical is finally making its way to the screen, with a cast of barely-knowns in the lead roles and a slew of new tunes and new orchestrations for the songs from the musical. In case there’s anyone on the planet who has seen neither the musical nor the 40-11 previous film versions of Gaston Leroux’s tale, Phantom tells of a disfigured musical genius who lives beneath the Paris Opera House. The Phantom takes an interest in a young singer and, through tutelage and terror, helps her rise to stardom, only to see her fall in love with a handsome young man. The Phantom vows revenge, but ultimately is transformed by the compassion of the young woman, and the love she feels for her young man, making the ultimate sacrifice in order that she may live and be happy. What’s going to be very, very interesting here is how this all comes together on-screen. 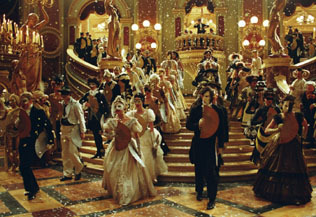 Fans of the musical are already up in arms that Michael Crawford, who originated the role of the Phantom, wasn’t cast in the film. However, they, along with the rest of humanity, likely breathed a sigh of relief when Madonna wasn’t cast as the Phantom’s object of obsession, Christine. Going with a cast of nearly-unknowns seems to be a good idea, since what they lack in name recognition is made up for by them not bringing any baggage to their roles. Still, the music for Phantom requires some major singing ability, particularly the Phantom and Christine, and if youth and looks have swayed the casting decisions - a view held in some circles - then Phantom will end up as disastrous a vehicle as Evita. And having Joel Schumacher at the helm doesn’t make one more sanguine; Schumacher has been behind the camera for many an on-screen train-wreck that started out sounding so good on paper.